At my friend’s place in the suburbs, I was feeding an adult raccoon with grapes. It went away for a while. Maybe it had its fill, or maybe grapes are not part of the raccoon’s diet. A few minutes later, it returned with two little ones and another adult. What on earth? A family! I can’t really tell the gender of the raccoons, and I don’t think I will even try to figure it out. This entry was posted in Animals and tagged Animals, Family portrait, nature, Photography, Raccoons by Perpetua. Bookmark the permalink. Up to five years ago raccoons(and skunks) used to be a sight to take for granted on any particular evening in the Fairview neighbourhood. 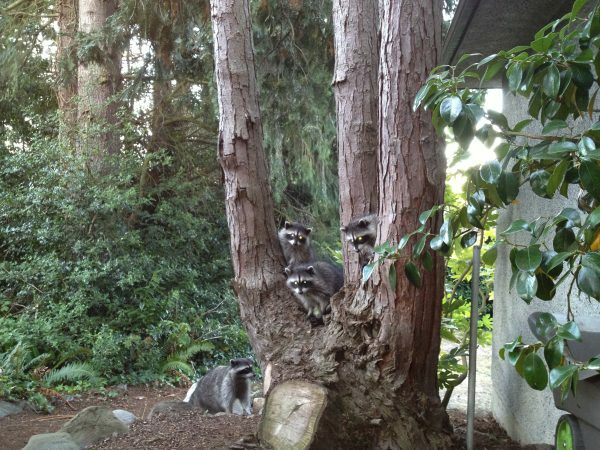 Large families of raccoons treated the condo-rich area on the north side of West Broadway , between Granville and Oak Street as their living room, kitchen and playground. I remember small groups of young raccoons happily running and tumbling across lawns — completely oblivious to any people. I’m sure raccoons and skunks are still plentiful toward Stanley Park in the West End and Renfrew Street on the eastside and perhaps deep into the west of the West Side, into Kitsilano and Dunbar-Southlands. Unfortunately the only four-legged creatures that truly abound in Fairview now are dogs and their little poop bags! There’s just too many constructions at Fairview. In my area, every night, we have family visits between these two. Skunks are braver to come out at day time than raccoons. In time they show up on our yard, I give them room. How cute. I guess he wanted to share the grape bounty with his friends/family! They are cute at a distance. Kids have to eat, too. Thanks for visiting and commenting. Good grief. Instead of teaching SOGI, schools must bring back Good Manners and Right Conduct as a subject! What a fun experience. I remember being shocked one day while walking in a park to look up and see a raccoon sprawled out asleep on an overhead tree limb. OH! That is shocking and a story to tell.